In the early 1960s, American advisers in Vietnam asked the U.S. Army to supply them an automatic grenade launcher. 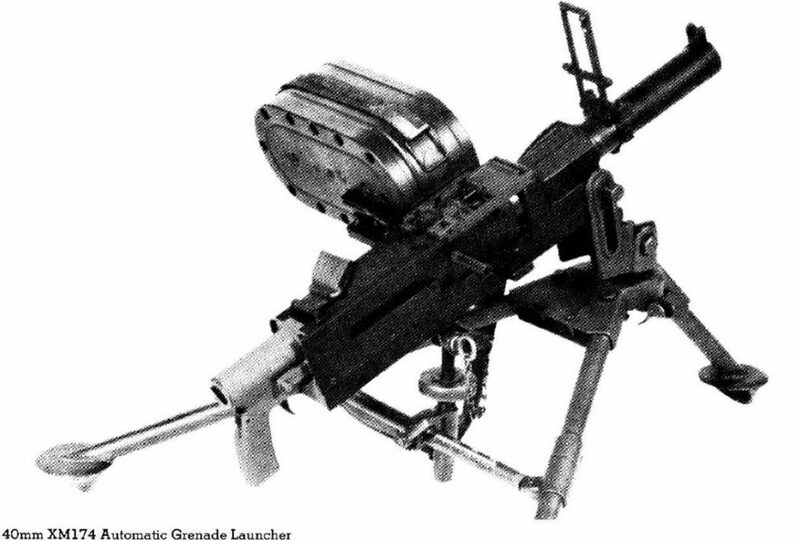 In September 1963, the Army asked industry to submit designs for a low-velocity 40-millimeter automatic grenade launcher. The new launcher had to weight less than 12 pounds — half the weight of an M60 machine gun — and feed from a belt. Four competing companies submitted designs and, in February 1964, the Army tapped Aerojet Ordnance Manufacturing Company for the contract. 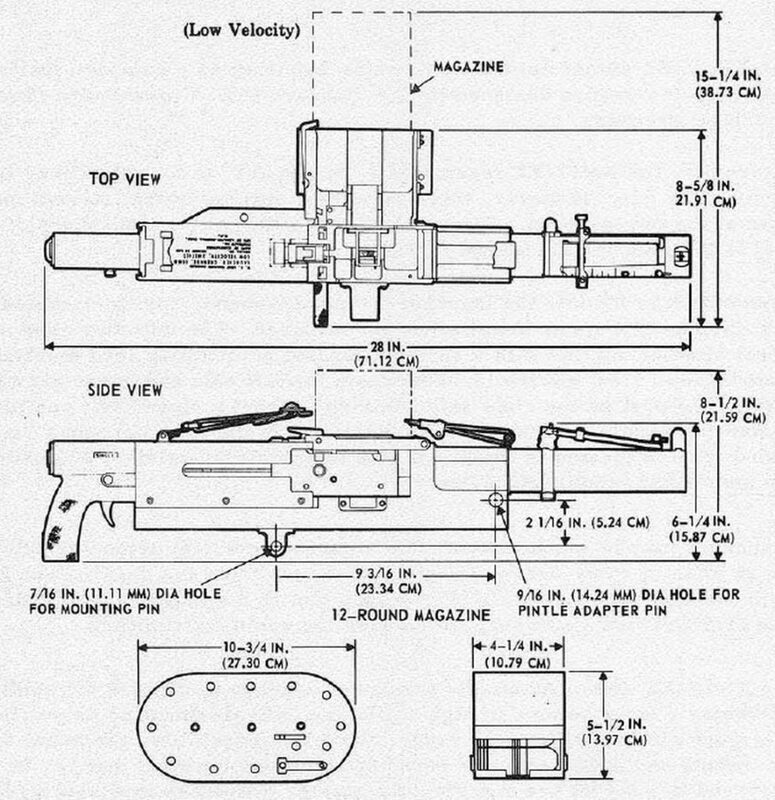 Throughout 1965 Aerojet worked up its XM174 design and, with feedback from the Army, altered it to fire from a closed rather than open bolt — and also added a semi-automatic function. The weapon sat on a tripod, but the Ordnance Corps also requested a version with a buttstock and a bipod. The idea was for variants of the XM174 to arm vehicles and leg infantry. The launcher design borrows its sights from the shoulder-fired, single shot M79. It appears that the general shape of the XM174’s receiver and pistol grip come from the M1919 medium machine gun, possibly for the sake of user familiarity. Aerojet continued development throughout 1966 with the assistance and oversight of Springfield Armory and Rock Island Arsenal. But despite being lighter than an M60, the XM174 proved to be less ergonomic and more difficult to carry in the field. Aerojet had developed a 12-round drum to carry the weapon’s belt, a feature that designers hoped would ease carrying and loading on the move. But testers in Vietnam — including Air Force base-security troops, the Army’s 27th Infantry Division and the U.S. Marine Corps — found the drum magazine to be fragile. The effective range was less than advertised. In the October 1969 photograph at top, Maj. Joseph Flynn from the 26th Marine Regiment explains the XM174 to a group of generals. While the XM174 underwent field-testing in 1968, Naval Ordnance Station Louisville developed the competing Mk19 launcher, a much more reliable weapon. The Army and Marines quickly adopted the Mk19 for mounted and dismounted use — and the Ordnance Corps abandoned the XM174. A few surviving XM174s remained in use in Vietnam until the early 1970s.